This was a favorite of mine as a Girl Scout, and best of all you can eat it! This is so easy to make and you can let your kids make this play dough. 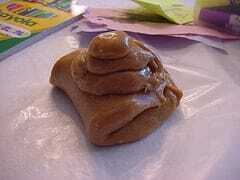 Have fun making and eating this peanut butter play dough. Not sure how to answer this one. I don’t know if you want to eat this after you play with it. I guess this play do could feed up to 10 people.